...when these experimental gentlemen get their hands on that concept, what you end up with is something that feels like a subversion of the club-music paradigm. Read Hypnagogue's take on the Paragaté album Pattern of Light. "A brief excursus on going back and forth" (August, 2014). 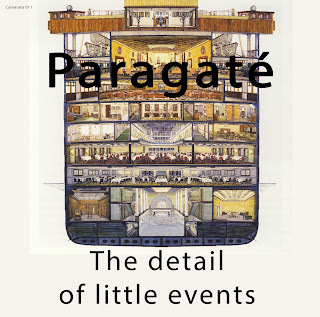 Newly released by Paragaté: The Detail of Little Events. Now available on Bandcamp for download. "Het mes" Tim Risher & Tom DePlonty (August, 2014). "How dogs think" Tim Risher & Tom DePlonty (August, 2014). "Baby needs a new pair of shoes" Tim Risher & Tom DePlonty (August, 2014). "Octopus" (for Meadhbh Hamrick) (August, 2014).